When the religious clause of the burgess’ oath came under discussion in the Associate synod, it appeared that the members entertained very different views of the subject ; the mournful consequence of which was a complete separation of the opposing parties into two distinct synods ; the one denominated the Burgher, the other the Antiburgher synod. Though not as yet officially connected with the Secession Church, yet as a conscientious member, Mr. Brown could not allow the question to pass without duly deliberating for himself and determining the path of duty ; the result of his deliberation was, that though not fully satisfied with regard to the lawfulness of the oath, he did not consider it a matter of sufficient magnitude to break up all Christian communion and fellowship ; but rather held it as a proper subject for the exercise of mutual forbearance. He consequently ranked with the adherents of the Burgher synod; of which body he continued a zealous and respected member till his death. During the vacations of his school, Mr. Brown attended the classes of philosophy and divinity under the superintendence of the Rev. Ebenezer Erskine and James Fisher ; till having gone through the several courses, he passed trials before the presbytery of Edinburgh, and was licensed by that reverend body at Dalkeith, in 1751, to preach the gospel in their connexion. On this sacred service, he entered deeply impressed with the awful responsibility of his office ; nor could he help being seriously affected with a coincidence, which one might think sufficient to shut the mouth of every calumniator ; namely, that about the same time, if not on the same night, on which he was licensed, and sent forth, in acknowledged innocence, a commissioned messenger of Christ, the author and principal propagator of those malicious imputations, from which he had suffered so much (see this post), was excommunicated by his own supporters.—His probationary labours were of short duration, two calls having been got up almost simultaneously for discharging the duties of the pastoral office ; the one from Haddington, the county town of East Lothian ; the other from Stow, situated on the southern border of the shire of Edinburgh. 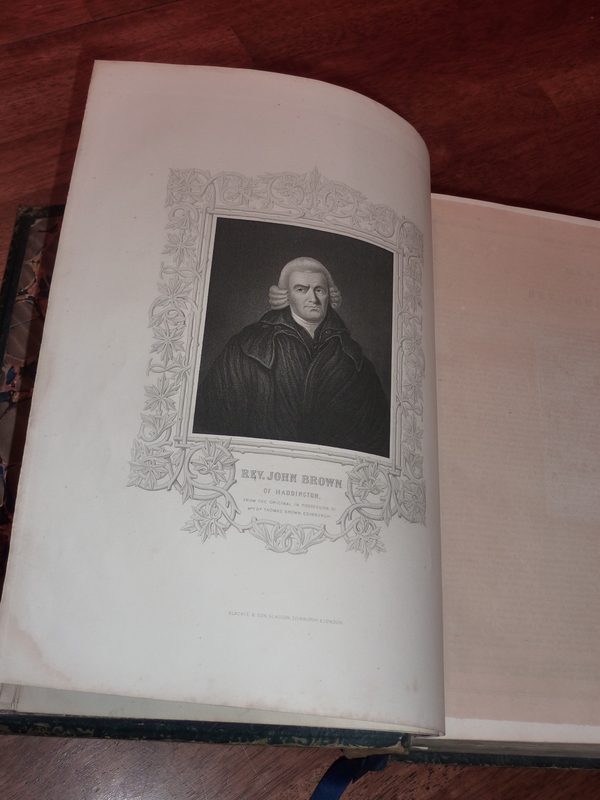 The presbytery left him the choice of the two situations ; and Mr. Brown accepted of Haddington, partly in consideration of several disappointments that congregation had sustained, and partly also because it was the smallest, and likely to afford him the more leisure to prosecute his studies. In gratitude to the people ofStow, for the predilection they had shown for him, and as a small compensation for their disappointment, he preached for them several Sabbaths, and continued to examine them every year till they were supplied with a pastor of their own. Read all the excerpts at this link.